Barnyard London is the latest project from Oskar Kinberg and Ollie Dabbous, the duo behind the one Michelin starred restaurant Dabbous. Kinberg and Dabbous both came from esteemed backgrounds. The former was previously the bar manager at The Cuckoo Club, and the latter a chef at the Michelin starred and much celebrated Texture. Together they conceived a concept that set the London dining scene on fire. When Dabbous opened in 2012 it was one of the hottest openings of the year. It received rave reviews with critics like Fay Maschler giving it 5 stars and calling it a game changer. With that, a destination restaurant was born. At Dabbous the focus is on innovation and invention, but with Barnyard, the approach the duo has adopted is much more simplistic with an emphasis on wholesomeness. 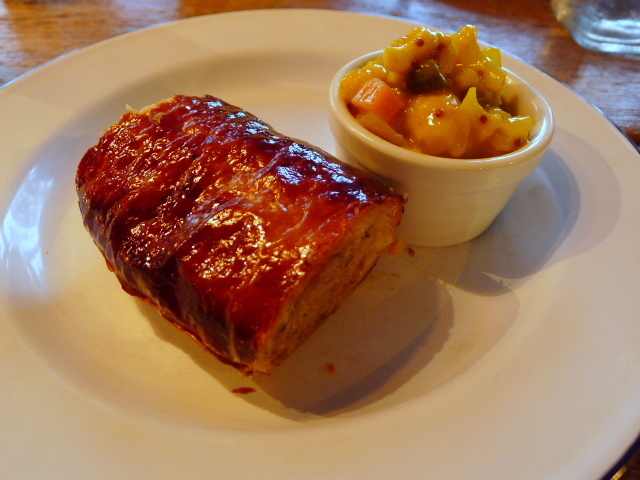 The Barnyard menu features items such as homemade sausage rolls and roast beef on toast. As the name suggests, there is a touch of the country in the restaurant’s set up, with the interior featuring reclaimed timber and corrugated tin. We tried the homemade sausage roll (£6) which was meaty and nicely seasoned although it would have been more enjoyable had it been served hot rather than lukewarm. The pastry was light and crispy, and came with a tangy, mustardy piccalilli that worked really well with the meatiness of the roll. A piece of roast suckling pig (£12) was really yummy in that fleshy, fatty sort of way. It had been properly roasted so it remained juicy and succulent. 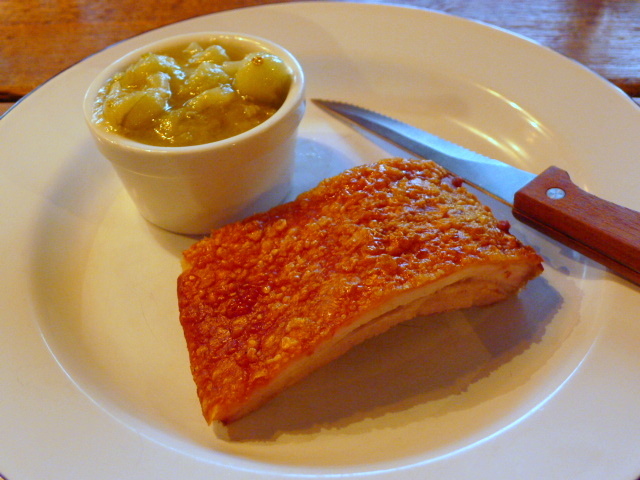 The crackling was also really good and crackled well on the tongue. The suckling pig was also a much better meat dish then the grilled leg of lamb with mint sauce (£14) as the latter proved to be quite dry, even with the mint sauce. The lamb itself was tender, but it needed something to bring the plate together. 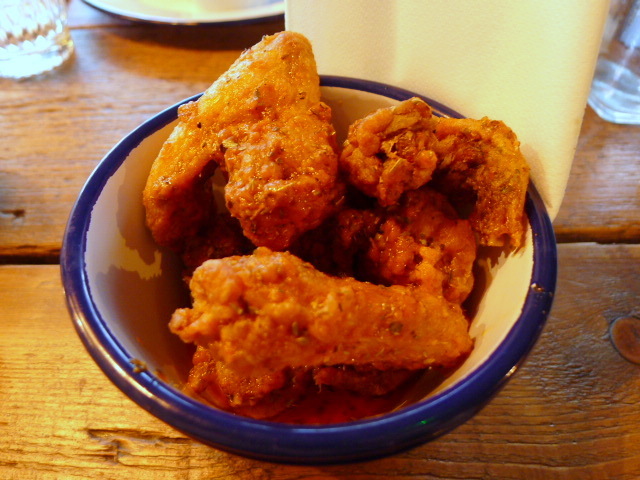 Crispy chicken wings (4 pieces – £6) came with a fabulous marinade of smoked paprika, garlic and lemon although the wings themselves were slightly overcooked and very oily. 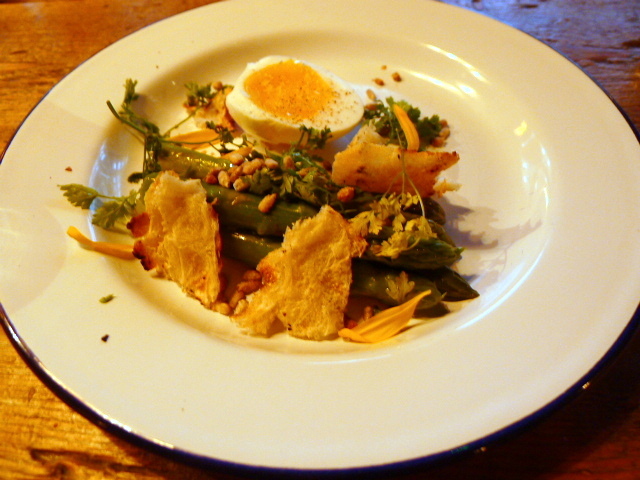 Asparagus with half a soft boiled duck egg (£8) was unremarkable and disappointing as the asparagus was cold. 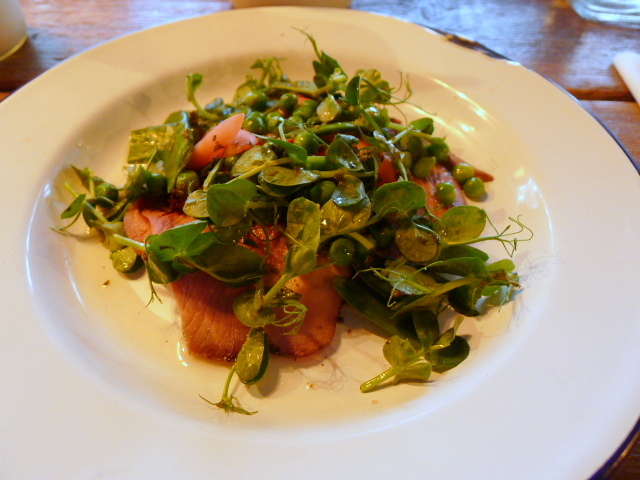 The accompanying chervil leaves had wilted, and although the duck egg had been perfectly cooked, it was a touch over seasoned. This was a sloppy dish that had been haphazardly thrown together. Drinks wise, there were a variety of non-alcoholic and alcoholic drinks including homemade lemonade, shandies and milkshakes. The Tahitian vanilla shake (£4.50) with white rum (£7) was wonderfully creamy, but it needed a touch more rum for a better kick. Gravitating towards dessert, a popcorn ice cream dessert (£5) with pieces of popcorn was really tasty, but it was the excellent smoked fudge sauce that proved to be particularly special as there was a luscious smoky quality to it that was subtle yet distinct. Even better was a second dessert of milk curd (£5) which was fabulously soft and creamy and made fragrant with a sprinkling of thyme. 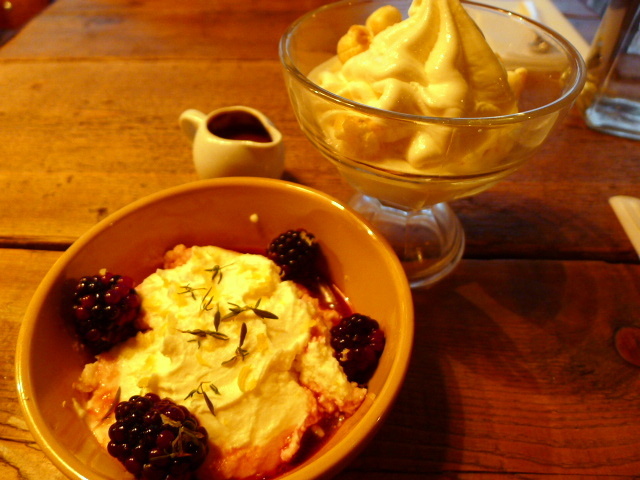 A blackberry and creme de mure syrup had been used to sweeten the curd, and the result was a beautiful dessert and our best dish of the evening. It’s easy to see the appeal of Barnyard for the casual diner. The food was decent and the prices were reasonable. 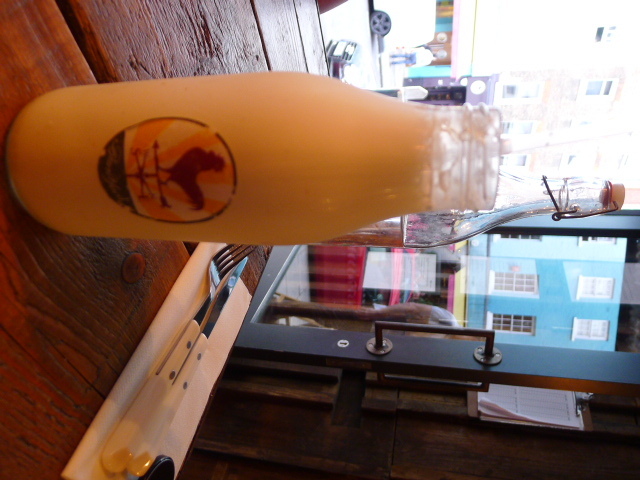 But given that all the dishes we tried had been pre-prepared rather than cooked a la minute, Barnyard is more like a grab a quick bite to eat type of place then a restaurant where you leisurely enjoy a meal in. The service was slightly pretentious and the tall bar stools were really uncomfortable which didn’t make our stay the most relaxed of all experiences. 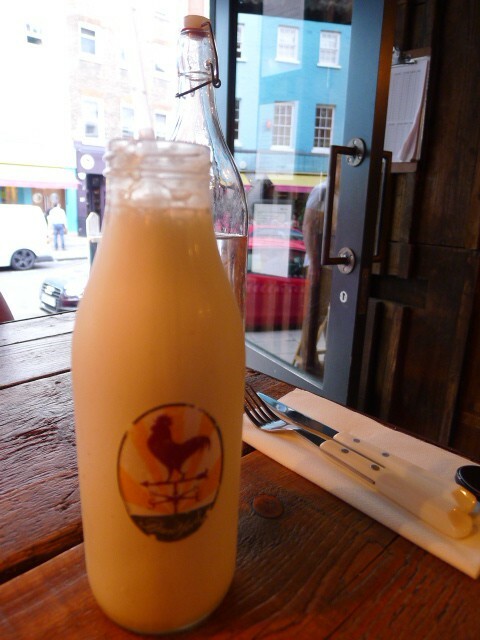 Simply put, Barnyard is great as a casual, down to earth, eat quickly type of place. Note there is a no reservations policy. Prices: £32 a head for the recommended three courses plus dessert per person. Excludes drinks and service. Hi Jennifer, I do hope you enjoy it if you go! Thanks for leaving a comment on my blog.